Peterborough is looking fantastic at the minute. The Christmas tree, lights and decorations in the city centre look really festive. I haven’t yet sampled some of the goodies on offer at the Christmas market on Cathedral Square, but I hope to soon. I don’t know if it is just the excitement of Christmas, which is now just two weeks away, but there does seem to be a real optimism in the air. I’ve never shied away from reminding people I have three main goals for the city and the council. I want to improve people’s prosperity, improve the education available in the city and improve people’s quality of life. Everything we do at the council should underpin one of these goals and right now, we’re making great progress. Last week we struck a deal that could see around 1,500 homes in Peterborough fitted with roof-top solar panels. Homeowners will receive £200 of free energy each year and one-off payments of £100 every five years. People will not have to pay a penny for the service. Not only will individual households benefit, but communities will too. The social enterprise company Empower Community Management will set up a community fund that will receive a percentage of the money generated. If just 1,500 homes sign up this fund could be worth around £1 million over the 20 year project. If more homes join the scheme the community fund will grow. The council will also benefit, with an expected return of another £1 million on the initial investment. If our early pilot proves popular there is no reason why this could not become a city-wide project, allowing everyone to benefit. We need to find innovative ways of improving the city’s chances as we face cuts to the amount of money we receive from the government. This scheme could drive Peterborough forward, providing local jobs, putting money back into people’s pockets and doing our bit for the environment at the same time. I’m also proud to be able to say that just this week we also approved plans that could secure investment of £130 million into the city. We plan to regenerate key city centre sites, including new office developments at Fletton Quays, with our partner Lucent Peterborough Partnership. Our plans will involve the sale of certain council assets, such as surface car parks, to make way for new buildings and developments including offices, shops, bars and restaurants that tenants will move into and pay proceeds to the council. This is one of the first investment and development models of its kind in the UK and it demonstrates the optimism our private sector partners share for the future of Peterborough. This project has the potential to create hundreds of long and short-term jobs, both during construction phases, and upon completion, in leisure, retail and office-based businesses. It could also provide much-needed affordable housing close to the city centre. These two projects have the potential to significantly improve the prospects of our city. We are adopting a very open-minded approach, letting investors tell us what they most want to see with a mix of retail, leisure, commercial and residential development available on each site. I believe these projects could breathe new life into many underused parts of the city centre and open up new jobs and opportunities for people in Peterborough. 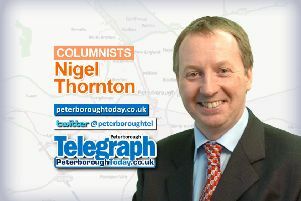 With the news of these plans it almost seems as if Christmas has come early for Peterborough. But rest assured, there is still plenty to get involved in over the next two weeks before the big day. The Christmas market is now open and we have carol services still to attend. I’m sure the city centre will be buzzing with activity during late-night shopping. I just now need to try and avoid eating one too many of those mince pies, and, being Italian, of course, the obligatory panettone!